The trips are made in the latest generation units, with permanent speed control, monitoring via GPS from the central, trained and evaluated drivers, complying with the rules of the national commission for transport regulation (cnrt). 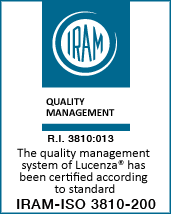 We are a company with iram certification (road safety standard) and we are on the way to ISO 9001 certification (quality standard). The quality of a trip is measured by the comfort and safety of arriving in time and form to the place you want.